These festive marshmallow and popcorn sparklers are a fun treat for kids to enjoy on the 4th. They are a great option if you will be celebrating outside where ice cream and popsicles won't hold up well in the summer heat. They also make for a pretty cute cupcake topper. You could even create them using mini marshmallows if you wanted to be a few of them on the same cupcake. Shannon has a great tutorial on how to dye marshmallows and then you will be well on your way to creating these fun treats for your own 4th of July get together. 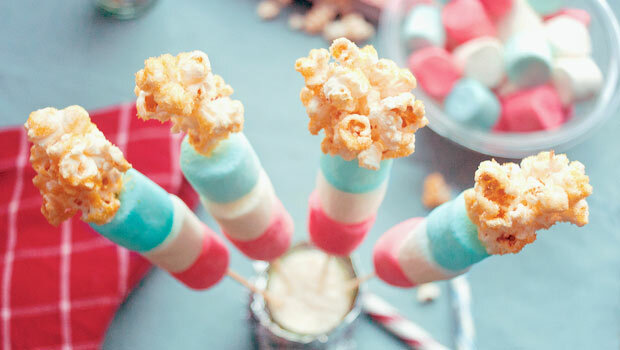 You can find out how to make your own patriotic marshmallow and popcorn sparklers over at dash. This is such a fun idea! I will definitely be doing this for the fourth!